The Program and the Startup class control startup and the configuration of the application runtime. 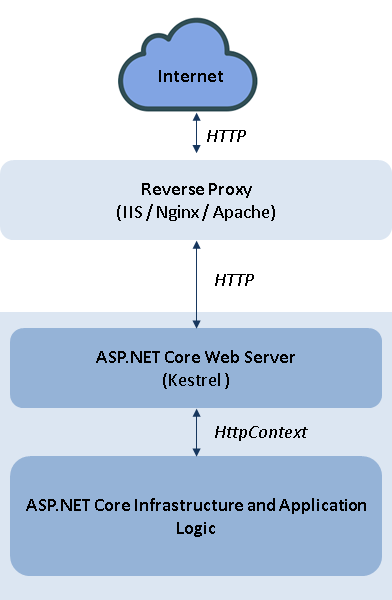 The ASP.NET core application is just a console application and like any other.NET console application and needs a Main method as the entry point of the application. The Program class contains the implementation of this static void Main method which is used to create an instance of IWebHost and run the same. IWebHost is one of the key components of the application which contains the application configuration and the ASP.NET Core Web server. The IWebHostBuilder is used to configure the ASP.NET Core Development Server (default is Kestrel) , Logging , IIS Integration (if required) , Content Root etc.We will take a deeper look into the IWebHost / IWebHostBuilder later. UseStartup is a generic extension method on IWebHostBuilder as shown below. But the interesting point to be noted here is the generic type parameter has no constraints TStartup can be any class. This is quite interesting as I am more used to having an interface driven strongly typed parameters in this kind of situations. It’s quite obvious that this Startup class needs to work in tandem with the IWebHost based on certain conventions. Now let’s take a look at the code that is in the Startup class by default. a) The Configure method is a must have for the Startup class. This is invoked by the runtime host, which creates an instance of IApplicationBuilder and passes it as an agrument.This IApplicationBuilder is used to configure the middleware pipeline by adding suitable components. The other parameter IHostingEnvironment can be omitted if not required. We will get into further details of the IApplicationBuilder interface while exploring the ASP.NET Core middleware pipeline. 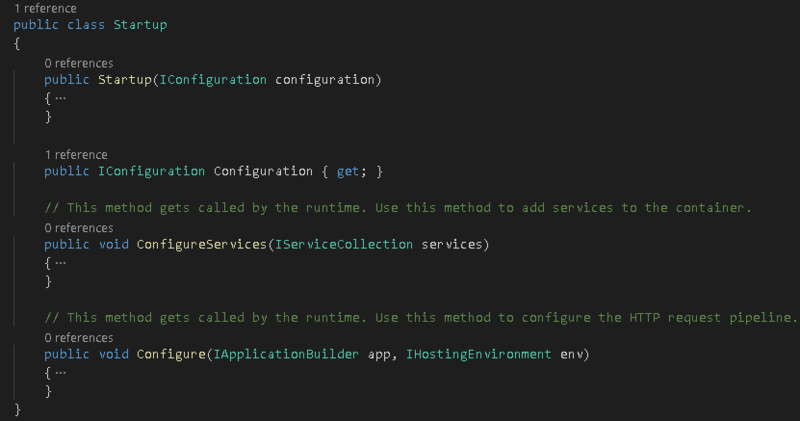 b) The ConfigureServices method is optional.This can be implemented to add additional services to the IServiceCollection.We will get into further details of the IServiceCollection interface while exploring the ASP.NET Core Dependency Injection. Now comes the question, is it a good design, making the startup class work by convention rather than having any strongly typed interface. I think it’s fine. It helps to keep things simple. This is the startup code so we can take up the additional overhead of reflection in inspecting the method definitions and then invoking it. Also, the chances of type mismatch or method mismatch is not there because its the startup code used to configure and initialize the application and should not have a widely varying behavior at runtime. This is also more flexible as we can different other parameters in the methods to suit our needs. Next comes the question why we have two classes for the application initialization, Program and Startup? 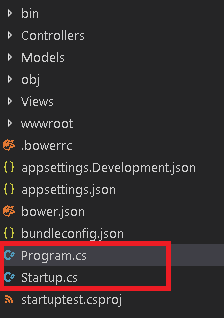 The segregation of responsibilities is very clear, the Program class contains initialization code that is used to set up the infrastructure that will rarely change over the lifetime of the project (like ASP.NET Core Web Server, Logging etc.) whereas Startup contains the initialization of features that are required to customize the application’s behavior.